Size: 16.75 x 14.5 inches. 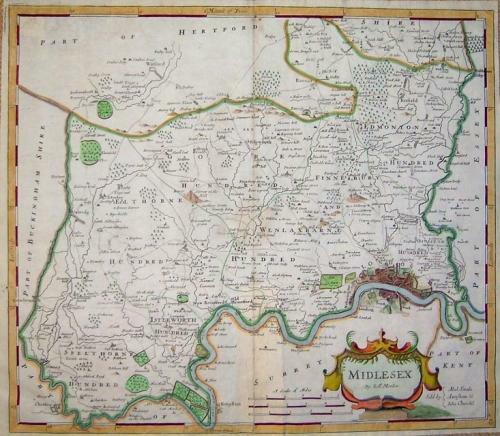 Robert Morden's important map of Middlesex. In the lower right corner it says, "sold by Able Swale, Awnfham & John Churchil. This maps shows roads or more appropriatley paths connecting the towns. Of particular interest in this map is Morden's measurement of longitude based on the prime meridan through St. Paul's Catherdal in London. This is presented in minutes along the top and in degrees along the bottom, with the latitude along both sides.